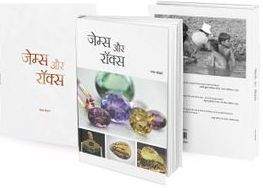 At the Gem Testing Laboratory of Jaipur, we frequently receive multi-strand necklaces assembled of various types of gemstones including natural, synthetic and treated counterparts. Once we received for identification an interesting necklace of four strings constructed of emeralds, which weighed approximately 3093 carats (figure 1). The depositor of this necklace was very well versed with the emeralds and knew the technical aspects of gem trade as well. All beads of emeralds were bright green in colour with slight variation in the shade; some appeared slightly bluish while some yellowish. 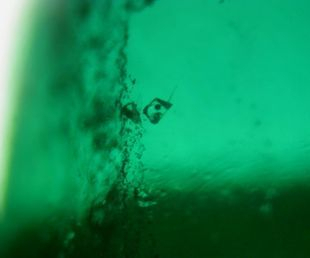 These similar appearing emeralds gave rise to a doubt to the depositor and initiated him to check with the Chelsea Filter and found it quite interesting. Most of the pieces gave a strong red reaction while only few of them were inert (figure 2). Such reaction led him to draw a conclusion regarding the origin of these emeralds as “synthetics mixed with few natural pieces”. With this information, he submitted the necklace for confirmation of his conclusions. We immediately checked for the Chelsea Filter reaction and found to be true as observed by the depositor. However, this reaction cannot conclude the origin of these emeralds since red reaction is due to the presence of chromium and any stone with high chromium percentage will appear red when viewed through a Chelsea filter. Presence of Iron will retard red colour as seen in most of natural emeralds. Hence, most of the synthetic emeralds appear red and this was considered as a separation test between a natural emerald and its synthetic counterpart. The recent synthetics which synthesized using chromium as well as iron as colouring elements do not appear red; and few natural emeralds like those originating from Columbia are rich in chromium and hence they may appear pink or red under Chelsea Filter. When these emerald beads were observed under a microscope we were amazed by the range of inclusions they displayed. They covered more or less all various features associated with synthetic emeralds. 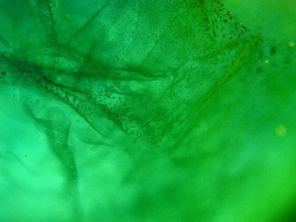 As widely known, emeralds are synthesized by two different methods- flux fusion and hydrothermal. The type of inclusions depends on the type of method used for synthesis. In the study, we observed two different sets of inclusions. First set (figure 3) comprised various inclusions like flux fingerprints which appeared thick, coarse and blackish (figure 3, left), numerous spicules associated with some golden particles / platelets (figure 3, centre), large cavities filled with thick and opaque flux material (figure 3, right). All these inclusions are associated with the emeralds grown by flux-fusion process. Another set of inclusions (figure 4) comprised seed plate with associated fine nail like and powdery inclusions (figure 4, left), transparent (possibly phenakite) crystals forming a nail-head spicule (figure 4, right) and a weak chevron growth features. These inclusions are associated with emeralds grown by the hydrothermal process. However, none of the bead displayed inclusions associated with natural emerald, hence we ruled out the possibility of mixture of natural emeralds in synthetic counterparts in this bead string necklace. This was further confirmed by the FTIR spectra of specimens consisted two different patterns of inclusions. When compared with the Chelsea filter reaction of these beads, it was found that the specimens appearing red were flux grown while hydrothermally grown remained inert. Hence, a synthetic emerald may remain inert or a natural emerald appears red under Chelsea filter. Therefore, one has to be careful while dealing in emerald beads since the synthetics are being offered for sale along with the natural counterparts. When mixed, the separation becomes even difficult because of the number of pieces and, practically it is not possible to check each and every piece in necklaces consisting of several hundreds to thousands of pieces. So……Beware!